Stock up in time for the Lenten Season and Mercy Sunday on this beautiful leatherbound Deluxe Edition of the Diary of Saint Maria Faustina Kowalska Divine Mercy in My Soul the book that sparked the Divine Mercy movement with more than 800,000 copies sold to date. 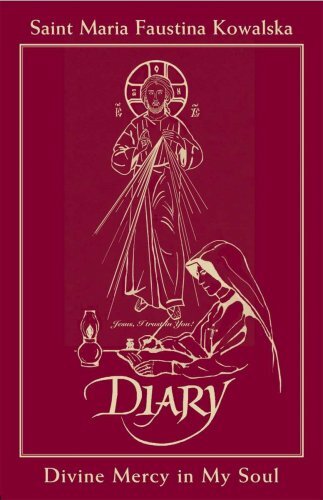 This special edition of the Diary, published in commemoration of the first World Apostolic Congress on Mercy, April 26, 2008 in Rome, Italy, is now available in soft burgundy or blue leather with gold foil, guilded edges and a ribbon marker. It is a book for every Catholics library one that many will want to keep next to their Bible for constant insight and inspiration. The Diary is an amazing narrative that chronicles the experiences of a simple, uneducated Polish nun who received a special call shortly before the outbreak of World War II. The message of The Divine Mercy is simple. It is that God loves us all of us. And, He wants us to recognize that His mercy is greater than our sins, so that we will call upon Him with trust, receive His mercy, and let it flow through us to others. The Diary is truly a vehicle of grace for all who read it, for in reading it one can realize the truth that mankind will not have peace until it turns with trust to Gods mercy, (Diary, 300).